A family friendly Mardi Gras. Seriously? 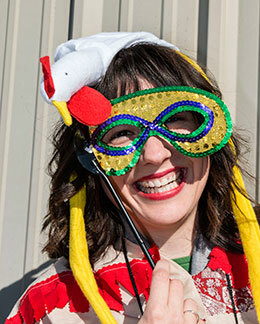 When most folks think Mardi Gras, they envision New Orleans, drunken parties, rowdy crowds. But almost every city, town and wide spot in the road along the Gulf Coast seems to have its own version of this pre-Lent party. And Lake Charles, across the state from New Orleans, bills itself as not only the second largest but also the friendliest Mardi Gras. We’re talking nine parades, a chicken run with waist-high tykes scrambling across the landscape after running roosters, couples in matching feather costumes, sweet cherubs in party dresses. And, oh yes, Cajun food. 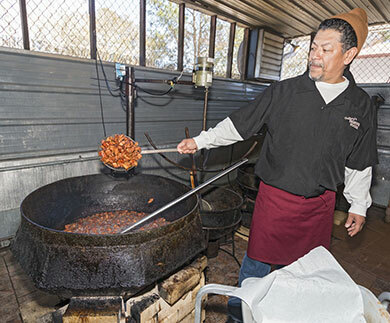 Darby Guillory cooks up a batch of his famous cracklins...deep fried pork fatback. Lake Charles, LA. But while you’re in the area there’s lots more...eco tours to see incredible numbers of birds, gator rescue operations, a rum factory, restored plantations. For those who don’t know, Mardi Gras also called Fat Tuesday, is all about partying down before enduring the sacrifices of Lent. Parties, liquor, costumes, really rich food...all those things, as a pious person, you’re supposed to deny yourself in coming weeks. What became a legal holiday in Louisiana in 1875 has its roots in ancient Rome where wild pagan parties were folded into the new Christian faith. Lake Charles, meanwhile, wanted a kinder, gentler version of all this revelry. The parades are major. If you’re on a float, you toss beads. If you’re on the curb, you catch them. Ah yes, the bead tossing. I asked. I got answers. Lots of them. The one that made the most sense was it’s a modern version of a pagan ritual of throwing flour as thanks to the gods for surviving yet another winter. Sounds good to me. Mardi Gras in Lake Charles, Louisiana. 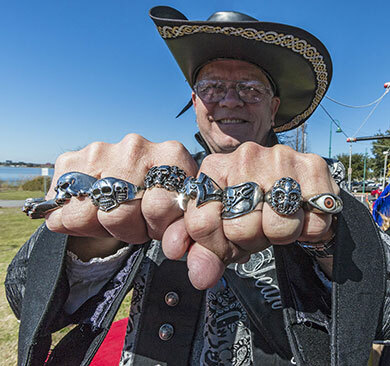 Meanwhile, my introduction to this was the Children’s Parade, where I got a chance to ride the Buccaneer float with pirate Ken, who showed up with his own coat, feathered hat and huge rings on each finger. Our one float had 50 boxes of plastic beads, each holding 60 dozen strands per box. And we were only one of some 100 floats in this parade. The beads all said “made in China.” Obviously, Mardi Gras single-handedly supports the Chinese economy. A few days later, this time at night, we were the catchers. There’s a trick to snagging a strand in mid air without being beaned on the noggin, though I never did quite figure it out. 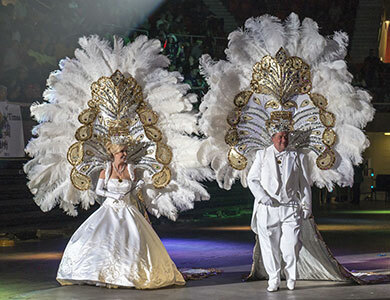 Between parades was the Royal Gala at the Lake Charles Civic Center. Anyone can come. A few dollars gets you a seat in the bleachers to watch 50-plus krewes strut around the arena. A krewe is actually a social group. Originally only men, now couples and some for just women, they hold parties throughout the year, do charity projects but most of all, concoct out-of-this-world costumes for Mardi Gras. Lake Charles family friendly Mardi Gras. 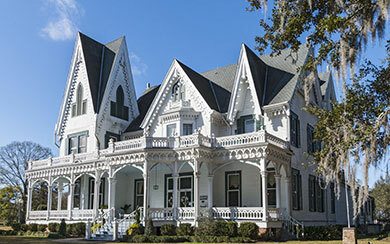 One story is that the word krewe was coined in the early 19th century by an organization calling themselves Ye Mistick Krewe of Comus as an archaic affectation for crew and over time, it became the most common term for a Mardi Gras organization. It’s the feathers, though. Yikes, there’s a LOT of feathers. One woman, who weighs all of 108 lbs, was being strapped into her 35 pound array of four-foot-tall, blinding white plumage. These things are worth thousands of dollars, take weeks to assemble and no, they are NOT worn outside on parade floats. Way too fragile. 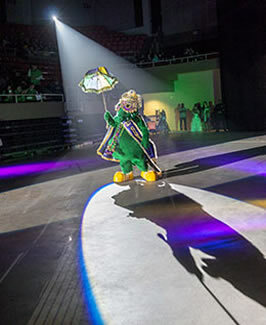 Back in the arena, the announcer introduced each krewe...a parade of delicate feathers, scary dragons that towered 20 feet, Gumbeaux the local alligator mascot, movie themes - yes, Star Wars. It was a furious march of colors. But honestly, my favorite event of the week was the chicken run. Iowa (pronounced I-O-Way) is this tiny town of maybe 3,000 people that is part of the Lake Charles area. The chicken run has been tradition for nearly 40 years. This year, as it has for many decades, the day started with Mary Victorian, 80 years old, stirring a huge pot on a stove in the local community center. Her roux (a secret mix of flour and fat), augmented by broth, was bubbling away. The idea was we would go out on floats, stopping along the way, dancing and singing for bags of ingredients that would go into Mary’s gumbo. Onions, bell peppers, celery (the holy trinity of gumbo), along with sausage, chicken and spices. “We’ll feed 500 today,” Mary told me. But the main event was the chicken run itself. 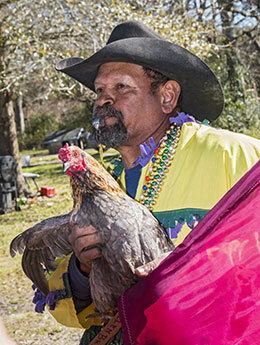 Rodney Victorian, chicken captain, holds one of his prize roosters for the traditional Chicken Run during Lake Charles family friendly Mardi Gras. Children in the Louisiana town of Iowa chase a rooster at different points during the parade route. 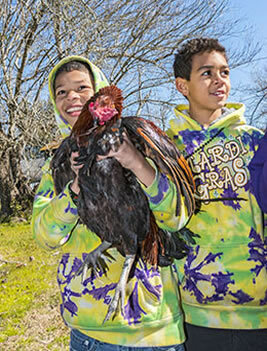 Victorious young boy chicken catcher during the traditional Chicken Run for Lake Charles family friendly Mardi Gras. Children in the Louisiana town of Iowa chase a rooster at different points during the parade route. Rodney Victorian had his prize roosters in tow. At random houses along the way, he strutted about, holding one of the handsome birds high in the air. Oddly, considering these birds have done this before, they were amazingly calm about it all. That is, until Rodney flung the bird of the moment into the air and total mayhem followed as a dozen pint-sized kids scrambled after it. 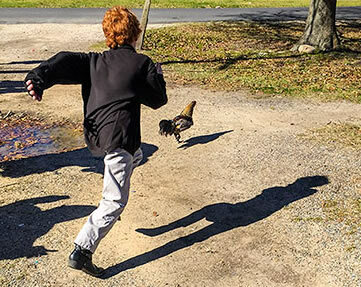 Kids running after rooster during the traditional Chicken Run for Lake Charles family friendly Mardi Gras. Children in the Louisiana town of Iowa chase a rooster at different points during the parade route. The first speedy little fowl made a run for the woods, making his bid to return to the wild. The next birds, in a blur of knees, sneakers and hands, were caught, usually by some agile 10-year-old who would stand there, shy, proud grin on his face, bird clutched to his chest. No, the birds weren’t destined for the pot. Athletic roosters don’t make good eating. Rodney would care for them until their run next year. When the week was over, I found myself waiting to board the jet back to Seattle with other Seattle-ites—taciturn descendants of Vikings who don’t look at strangers, much less casually talk to them. I was already missing the warmth and outgoing friendliness of the south...a place where total strangers say good morning and hi and how are you today and wait for an answer because they really want to know. Mardi Gras is scheduled 47 days before Easter and can occur on any Tuesday from February 3 through March 9. In 2017, it’s Feb. 28. Parties are scheduled leading up to that date. by the same family for six generations. 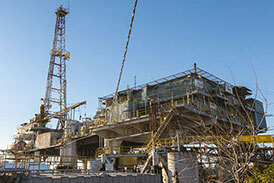 Schriever, LA. 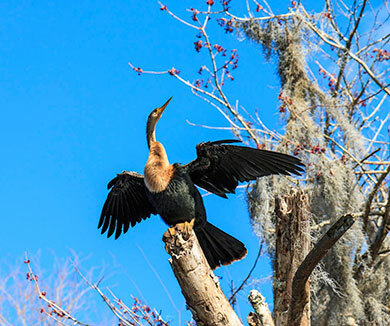 An anhinga dries itself while perched on the branch of a winter bare tree in southern Louisiana. 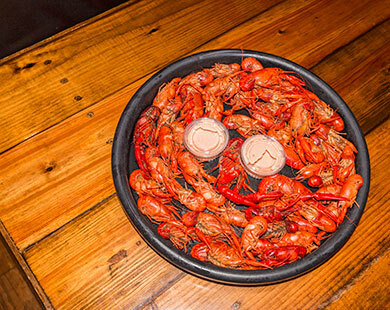 Boiled crawdads, a specialty of southern Louisiana. At Big Al's Seafood in Houma, LA. Crawdads are related to lobsters. It's a lot of work to peel them but they are so tasty. Man holds two rescued baby one-year-old alligators. 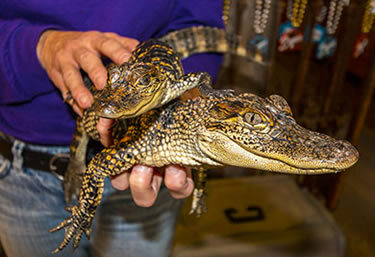 Part of gator rescue program in Jennings, Louisiana at Gator Chateau at Jeff Davis Parish Tourist Commission office. 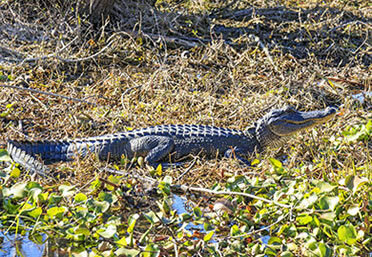 Young alligator swims among water hyacinths in marsh near Mandalay National Wildlife Refuge in southern Louisiana. Local guide named her Lollypop.